Rooftop solar panel installer Vivint said Tuesday it has terminated the deal to be taken over by SunEdison after SunEdison failed to "consummate" the merger. The Vivint deal was set to expire on March 18. Vivint shares were flat at $5.51. SunEdison Inc. (NYSE: SUNE) could be liable for much more than the $34 million breakup fee, and a sizable settlement is expected. 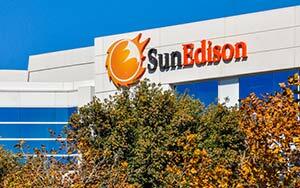 While the news has the SunEdison stock price soaring, the transaction has been in jeopardy for months. Hedge funds and other investors had criticized the deal as the SunEdison stock price fell in 2015. The SUNE stock price was down almost 94% since the Vivint deal was announced. Vivint's stock price had fallen 52%. Like other solar companies, the Vivint and SunEdison stock prices suffered because of crashing oil prices. When oil prices are lower, demand for solar power decreases. That can cause major drops in solar stocks. But SUNE stock had also been under pressure as the company tried to grow quickly through acquisitions. SunEdison had a market cap of $600 million before Tuesday's gains, as well as long-term debt of $9.77 billion as of Sept. 30. That huge debt figure had investors and analysts questioning whether SunEdison should be purchasing Vivint. As part of the Vivint deal, SunEdison yieldco (a company formed to own assets that produce cash flow) TerraForm Power agreed to buy Vivint's rooftop solar portfolio for $799 million. That was down from the original purchase price of $922 million. Still, many activist investors criticized the deal. Hedge fund Appaloosa's Chief Executive David Tepper had called on TerraForm to "resist" the deal. The influential investor said it was a departure from TerraForm's business model and would put shareholders at risk. And Tepper wasn't the only activist investor with a heavy hand in thwarting this deal. In January, David Einhorn's Greenlight Capital said it was in talks with SunEdison regarding a board seat. The firm was pressing for asset sales or an outright sale of the company itself. Now that the deal has been called off, many on Wall Street are happy with the prospects for the Vivint and SunEdison stock prices moving forward. "We believe both companies will be better off on their own," Cowen and Co. analysts wrote in a note to clients Tuesday. The United States is already one of the world's biggest clean-energy investors, but the extension is a major boost to the industry and solar stocks like SUNE stock. Ramped up solar spending and extended solar tax credits will bring new life into the industry in 2016 and beyond.